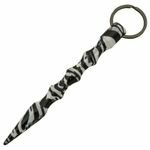 The Grip Kubaton has finger grooves to provide a more secure hold when performing defensive strikes and a tapered tip to concentrate your power more effectively. Made from solid aluminum, its light and very strong allowing your movement to multiply into intense pressure rapidly. 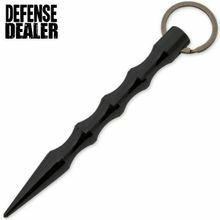 The kubotan can be used in a variety of ways in self defense, such as a key flail, striking or gouging tool. Don't sacrifice your fingers or knuckles in an attack. You can do more damage with this product than you can with fingers or fist alone. Weighs just 1.5 oz. and is just over 5 inches long. 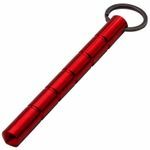 11: Two other items that you may wish to carry on your person that will quietly but firmly make the point to the client (and anyone else) that you are aware of the need for personal safety are a personal alarm and, especially, a Kubaton (kubotan) on your key chain. Learn how to use the Kubaton. Product came right away. Very good quality and low price. I paid a lot more for very the very same product sold under a different name.